The Israel Support Committee recognizes we are forever linked to our Jewish brothers and sisters in Israel. Our mission is to educated, advocate and provide opportunities to support the people and state of Israel. 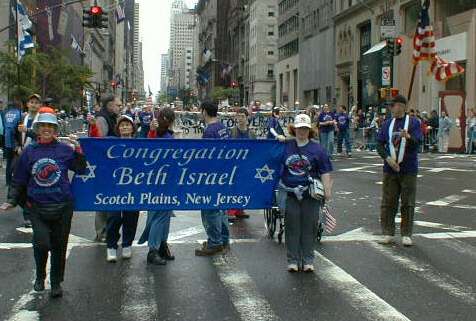 The committee has respresentatives from 7 neighboring synagogues in addition to Congregation Beth Israel: Anshe Chesed of Linden, Union County Chabad, Congregation Israel of Springfield, Temple Beth O’r/Beth Torah of Clark, Temple Beth-El Mekor Chayim of Cranford, Temple Emanu-El of Westfield and Temple Sholom of Scotch Plains. We run Israel Documentary Film Festivals, host speakers to discuss issues in Israel, organize panel discussions, letter writing campaigns and clothing drives for disadvantaged children in Israel. Videos played and distributed about the Israeli/Palestinian conflict, checkpoints, Israeli fence, Palestinian incitement, intifada, and other relevant issues. Israeli Food Festival vendors of Israeli wines and food products providing samples and sales to familiarize community with availability. Established kesher (connection) with Israeli family whose eldest son Moshe was killed by a Palestinian suicide bomber in December 2002. CBI members visit during trips to Israel. We hosted their youngest son at our synagogue. A plaque was dedicated to Moshe in our synagogue. Gifts have been sent to the family on Jewish holidays. A Ring of Trees from JNF was purchased in Moshe’s honor. We contributed to the creation of a children’s park in Gilo dedicated in Moshe’s memory.